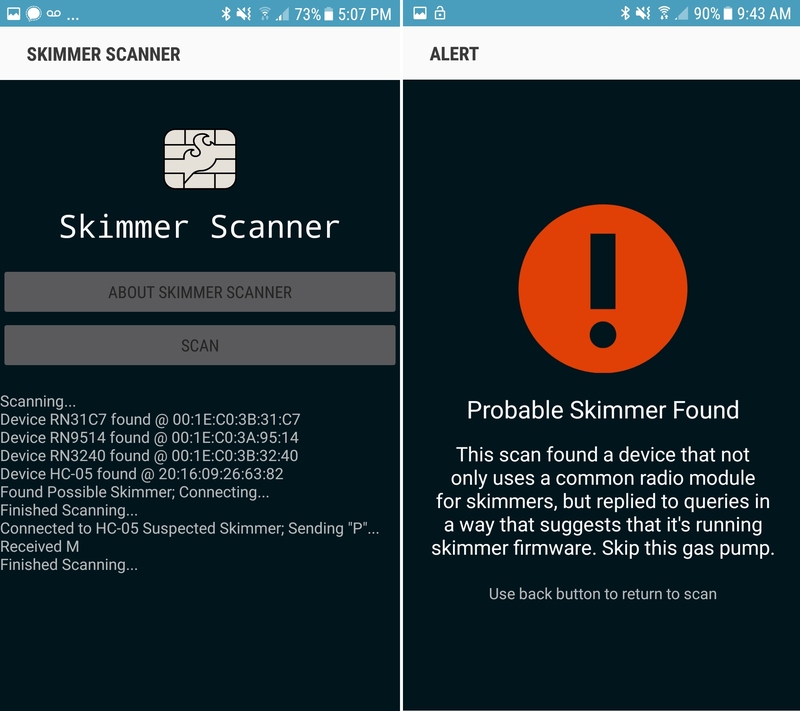 The app detects a specific Bluetooth signal and, if found, it tries to establish a connection and send a command that will verify the existence of a skimmer in your general area. The app is looking for Bluetooth networks with an ID of HC-05, which turned out to be the default on devices Seidle tested; if it finds one you’ll be alerted. 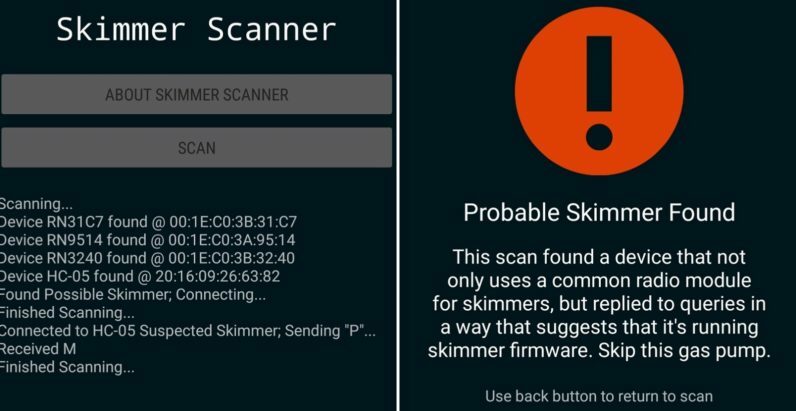 SparkFun’s Bluetooth device-detecting app is called Skimmer Scanner and it’s a bare-bones tool that appears to work as intended. It’s free and open-source and the developer says it doesn’t keep or record any information. The designers of this skimmer were smart, it’s better to make these devices easy to connect to than to add a layer of security. What’s the worst that could happen? The device is detected and removed from the pump. Meanwhile, 10 more have been deployed for a total cost of $100. The only tool necessary is a key to unlock the pump. The locks are basic and there are no more than a few different key designs for all gas pumps – master keys for the model. This isn’t new; for decades, criminals have been using various computer hardware devices to intercept credit card numbers during transactions. But hardware hacking is no longer the domain of only talented – albeit shady – individuals. It’s the purview of anyone with a laptop, a car, and the stolen credit card information necessary to buy an easily made piece of hardware online. While I haven’t had the opportunity to ride around looking for skimmers yet, I can happily confirm that there are no skimmers scamming in my office. Update 2:30 PM CST 9/20: Updated to clarify that Nick Poole wrote the application and Nate Seidle researched the skimmers.